"One of his favorite quotations was, "running a business is a lot like rowing a boat in the river. You either go forward or backward." Titus's daughter-in-law, Mary Schmid, married to Titus’s son Jim, tells of Titus writing letters. 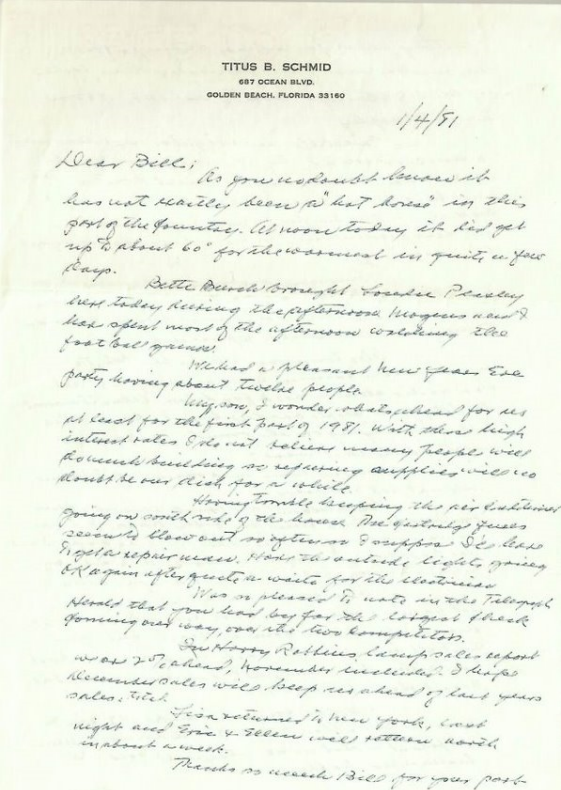 Fortunately, we have found over 30 letters written by Titus over a twenty two year period, from 1960 to 1982, when Titus was age 68 until his death at age 90. 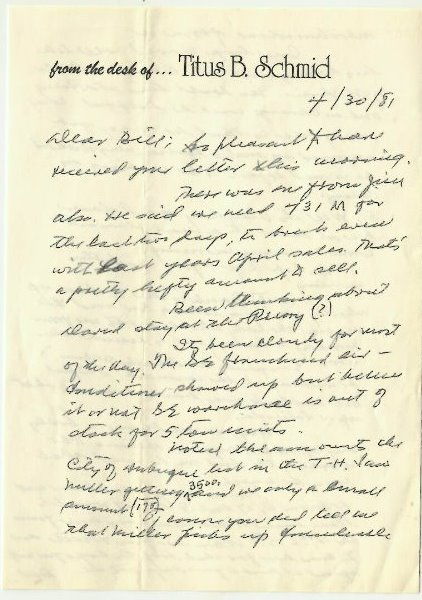 Editor’s note: Titus wrote his children at least weekly when he was living in Florida for the winter, but only a few letters were saved, mostly by his son Bill. 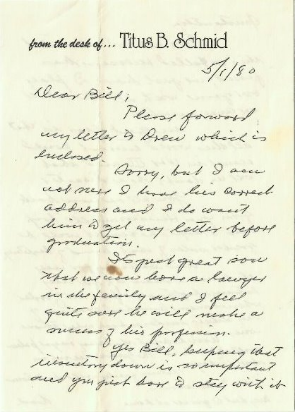 While these letters were his personal correspondence with his family, he often included comments about the business. Below, I have compiled some of the business comments so that you, the reader, can begin to understand the lifelong passion Titus had for Crescent Electric Supply Company. These letters are in chronological order. 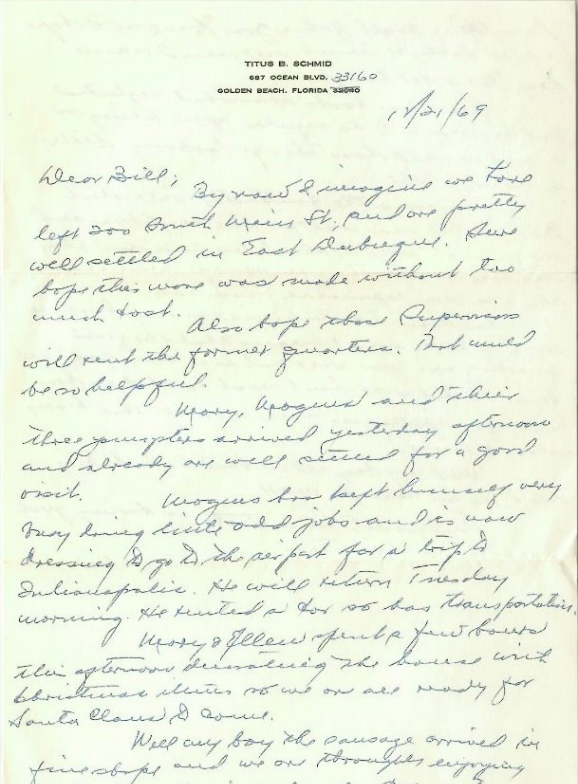 Editor’s note: "…" is used to separate the thoughts as Titus sprinkled his business comments throughout his letters. …Tomorrow finishes up another sales month and I trust it will be a profitable one. …Well my boy, all we can do is to try hard, no one can do more…. …Got such a kick out of the first quarter report which shows our St. Louis house is number one. Joliet had been holding first place for quite some time…. …Jim in his note says we need a big jump in sales per day for the last three billing days to equal last year’s sales. Gosh I hope we make it…. This is a signed photo Reg Jones from General Electric sent to Titus. As you have read, Titus remained devoted to the success of Crescent Electric Supply Company throughout his life. While he turned over the day to day management of the business to his sons in the 1960’s, he never failed to stay in touch with the business and be supportive of his son’s efforts. 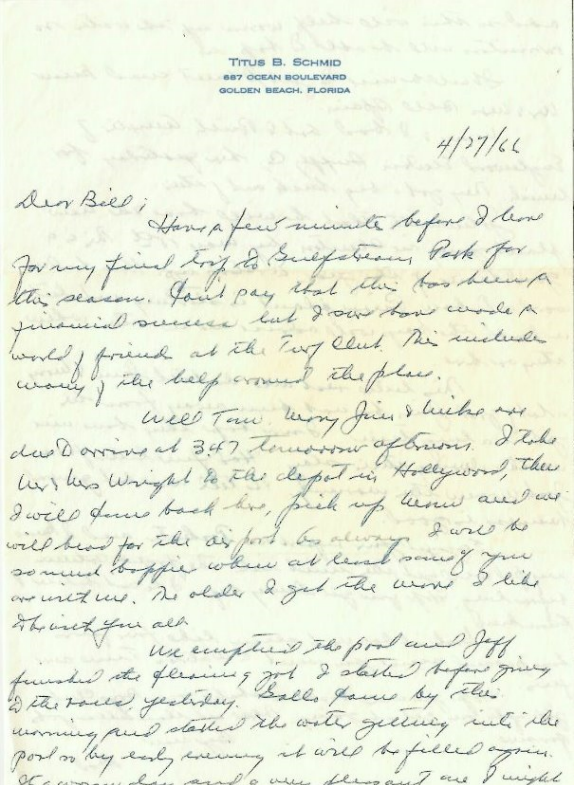 These letters captured his entrepreneurial spirit and guidance when times were challenging.